The Metropolitan Borough of Tameside is a metropolitan borough of Greater Manchester in North West England. It is named after the River Tame, which flows through the borough and spans the towns of Ashton-under-Lyne, Audenshaw, Denton, Droylsden, Dukinfield, Hyde, Mossley and Stalybridge plus Longdendale. Its western border is approximately 4 miles (6.4 km) east of Manchester city centre. It borders High Peak in Derbyshire to the east, the Metropolitan Borough of Oldham to the north, the Metropolitan Borough of Stockport to the south, and the City of Manchester to the west. As of 2011[update] the overall population was 219,324. The history of the area extends back to the Stone Age. There are over 300 listed buildings in Tameside and three Scheduled Ancient Monuments, which includes a castle of national importance. The settlements in Tameside were small townships centred on agriculture until the advent of the Industrial Revolution. The towns of the borough grew and became involved in the cotton industry, which dominated the local economy. The current borough was created in 1974 as part of the provisions of the Local Government Act 1972. Since then the area has been administered by Tameside Borough Council, which has been judged by the Audit Commission to be "performing strongly". The history of the area stretches back up to 10,000 years; there are 22 Mesolithic sites in Tameside, the oldest dating to around 8000 BC; 21 of the 22 sites are in the hilly uplands in the north east of the borough. Evidence of Neolithic and Bronze Age activity is more limited in the borough, although the Bronze Age Stalybridge Cairn is the most complete prehistoric funerary monument in the borough. The people in the area changed from hunter-gatherers to farmers around 2500 BC–1500 BC due to climate change. Werneth Low is the most likely Iron Age farmstead site in the borough, probably dating to the late 1st millennium BC. Before the Roman conquest of Britain in the 1st century AD, the area was probably part of the territory of the Brigantes, the Celtic tribe controlling most of what is now north west England. The area came under control of the Roman Empire in the second half of the 1st century. Roads through the area were established from Ardotalia fort in Derbyshire to Mamucium (Manchester) west of Tameside and Castleshaw Roman fort in the north. Romano-British finds in the borough include a bog body in Ashton Moss, occupation sites at Werneth Low, Harridge Pike, Roe Cross, and Mottram. A 4th-century coin hoard was found in Denton and is one of only four hoards from the 4th century in the Mersey basin. A Byzantine coin from the 6th or 7th centuries, also found in Denton, indicates continued or renewed occupation once the Romans left Britain in the early 5th century. Nico Ditch, an earthwork stretching from Stretford to Ashton-under-Lyne, is evidence of Anglo-Saxon activity in Tameside. It was probably dug between the 7th and 9th centuries and may have been used as a boundary between the kingdoms of Mercia and Northumbria. Further evidence of Anglo-Saxon era activity in Tameside comes from the derivation of settlement names from Old English such as -tun, meaning farmstead, and leah meaning clearing. According to the Domesday Survey of 1086, Tameside was divided into four manors, those of Tintwistle, Hollingworth, Werneth, and Mottram. The land east of the River Tame was in the Hundred of Hamestan in Cheshire and held by the Earl of Chester while to the west of the river was in the Hundred of Salford under Roger de Poitevin. These manors were divided to create further manors, so that by the 13th century most of them were owned by local families and remained in the hands of the same families until the 16th century. Manorialism continued as the main for of administration and governance until the mid-19th century. The Industrial Revolution had a significant impact on Tameside; the area, whose main towns had previously been Ashton-under-Lyne and Mottram-in-Longdendale, was transformed from a collection of the rural, farming communities into mill towns. The towns of Ashton-under-Lyne, Dukinfield, Hyde, Mossley and Stalybridge have been described as "amongst the most famous mills towns in the North West". With only a brief interruption for the Lancashire Cotton Famine of 1861 to 1865, factories producing and processing textiles were the main industry in Tameside from the late-18th century until the mid-20th century. In 1964, Dukinfield Borough Council convened a meeting of neighbouring local authorities with the aim of formulating a policy of cross-authority social improvement for the districts in the Tame Valley. Following deindustrialisation, the area had suffered "gross-neglect" and had large areas of housing unsuitable for human habitation. This joint enterprise comprised the nine districts that would become Tameside ten years later, plus the County Borough of Stockport. This collective agreed on creating "a linear park in the valley [of the River Tame] for the use of the townspeople and as a major recreational resource within the Manchester metropolis". Tameside was created on 1 April 1974, by the Local Government Act 1972 as one of the ten metropolitan districts of Greater Manchester. It took over the local government functions of nine districts which were formerly in the administrative counties of Lancashire and of Cheshire. In 1986 Tameside effectively became a unitary authority with the abolition of the Greater Manchester County Council. A name for the metropolitan borough proved problematic. The Redcliffe-Maud Report had used the name Ashton-Hyde, but double-barrelled names were prohibited for the new districts. Had Ashton-under-Lyne been a county borough, or had had a less common name, "it might have been chosen as the new name" for the new district. The eight other towns objected, adamant that "a new name should be found". Thirty suggestions were put forward, including Brigantia, Clarendon, Hartshead, Kayborough, Tame, Ninetowns, and West Pennine, with Hartshead (with reference to Hartshead Pike) being the most popular throughout most of the consultation period. However, the name Tameside (with reference to the River Tame, but a concocted name with no historical basis) won 15 votes to Hartshead's 10 in a final stage of voting. The borough underwent a boundary review in 2002. The review altered the areas covered by some wards to ensure councillors represented roughly equal numbers. Between 12 October 2006 – 8 January 2007, a dispersal order was enforced in the Dukinfield and Newton Hyde areas of the borough. The move was designed to reduce anti-social behaviour. A representative of Stalybridge police post said "Due to the serious nature of recent incidents in Dukinfield and Newton Hyde involving a number of confrontations between large groups of youths, the decision has been made to introduce a Dispersal Order". Werneth Low with the Greater Manchester Urban Area in the background. Tameside is bordered by the metropolitan boroughs of Stockport and Oldham to the south and north respectively, the city of Manchester to the west and the borough of High Peak in Derbyshire to the east across Longdendale. Tameside features flat lowlands in the west and highlands in the east where the western edge of the Pennines encroaches on the borough. The hills in the east include Hartshead Pike and Werneth Low which is also a country park. As well as coal measures running north-south through the centre of the borough, there are areas of peat in the north east and there are large areas of boulder clay all over Tameside. Ashton Moss is a peat bog covering about 107 hectares (260 acres) and Denton Moor is an area of about 81 hectares (200 acres) of peat. 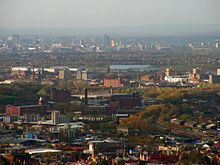 A view over Tameside, towards Manchester city centre. Waterways in Tameside include the rivers Medlock and Etherow, which form parts of Tameside's western and eastern boundaries respectively, and the River Tame crosses the borough north to south, giving Tameside its name. The Ashton Canal, the Hollinwood Branch Canal, the Huddersfield Narrow Canal, and the Peak Forest Canal all run through the borough. There are also several reservoirs, including the Audenshaw Reservoirs. Greenspace accounts for 63.5% of the Tameside's total area, domestic buildings and gardens comprise 17.4%, and the rest is made up of roads and non-domestic buildings. Localities within the boundaries of Tameside include: Ashton-under-Lyne, Audenshaw, Broadbottom, Carrbrook, Copley, Denton, Droylsden, Dukinfield, Flowery Field, Gee Cross, Godley, Godley Green, Guide Bridge, Hartshead Green, Hattersley, Haughton Green, Hazelhurst, Heyrod, Hollingworth, Hyde, Landslow Green, Luzley, Millbrook, Mossley, Mottram in Longdendale, Newton, Park Bridge, Roe Cross, Stalybridge, Warhill, and Woolley Bridge. The residents of the Tameside are represented in the United Kingdom Parliament by members of Parliament (MPs) for three constituencies. Ashton-under-Lyne, which also includes parts of the Metropolitan Borough of Oldham, is represented by Angela Rayner (Labour). Denton and Reddish, which also covers parts of the Metropolitan Borough of Stockport, is represented by Andrew Gwynne (Labour). Stalybridge and Hyde, which is entirely within Tameside, is represented by Jonathan Reynolds (Labour). Tameside is part of the North West England constituency in the European Parliament. North West England elects eight MEPs, as at 2014 made up of three Labour members, three members of the United Kingdom Independence Party, and two Conservatives. Tameside Borough Council was assessed by the Audit Commission and judged to be "improving strongly" in providing services for local people. Overall the council was awarded "four star" status meaning it was "performing strongly" and "well above minimum requirements", putting it in the top 38% of all local authorities. Civil parishes form the bottom tier of local government; the parish councils are involved in planning, management of town and parish centres, and promoting tourism. Mossley is the only civil parish in Tameside. In 2001 9,856 people lived there, 4.6% of the borough's population. Before becoming a civil parish, Mossley was a municipal borough. The unparished areas are: Ashton-under-Lyne (municipal borough), Audenshaw (urban district), Denton (urban district), Droylsden (urban district), Dukinfield (municipal borough), Hyde (municipal borough), Longdendale (urban district), and Stalybridge (municipal borough). The status of each area before 1974 is shown in brackets. An urban district was a type of local government district which covered an urbanised area. Ashton-under-Lyne, Audenshaw, Denton, Droylsden, and Mossley were previously in Lancashire. Dukinfield, Hyde, Longdendale, and Stalybridge were in Cheshire. At the 2001 UK census, the Metropolitan Borough of Tameside had a total population of 213,043. Of the 89,981 households in Tameside, 35.7% were married couples living together, 31.0% were one-person households, 7.8% were co-habiting couples and 9.3% were lone parents, following a similar trend to the rest of England. The population density was 2,065/km2 (5,350/sq mi) and for every 100 females, there were 94.2 males. Of those aged 16–74 in Tameside, 35.2% had no academic qualifications, significantly higher than 28.9% in all of England. 4.8% of Tameside's residents were born outside the United Kingdom, significantly lower than the national average of 9.2%. The largest minority group was Asian, at 4.0% of the population. In 1841, 8.5% of Tameside's population was middle class compared to 14% in England and Wales; this increased to 13.1% in 1931 (15% nationally) and 37.0% in 2001 (48% nationally). From 1841 to 1991, the working class population of Tameside and across the country was in decline, falling steadily from 58.0% (36% nationally) to 22.8% in 1991 (21% nationally). It has since increased slightly, up to 32.9% (26% nationwide). The rest of the population was made up of clerical workers and skilled manual workers. Although Tameside has only existed as a Metropolitan Borough since 1974, the table below details the population change – including the percentage change since the last census 10 years earlier – in the area since 1801 using figures from the towns, villages, and civil parishes that would later become constituent parts of Tameside. Source: A Vision of Britain through Time; accessed 9 January 2016. At the 2001 UK census, 75.5% of Tameside's residents reported themselves as being Christian, 2.5% Muslim, 1.4% Hindu, and 0.1% Buddhist. 12.1% had no religion, 0.2% had an alternative religion and 8.1% did not state their religion. Tameside is covered by the Roman Catholic dioceses of Shrewsbury and Salford, and the Church of England dioceses of Manchester and Chester. There are two Grade I listed churches in Tameside, St Anne's Church, in Haughton, was built in 1881 in the Gothic Revival style by J Medland Taylor. St Michael and All Angels' Church in Ashton-under-Lyne is a 15th-century parish church which was virtually rebuilt in the 19th century. A church on the site dates back to at least 1262. St Lawrence's Church, in Denton, is a Grade II* listed building and a timber framed church. It was remodelled by J Medland Taylor in 1872. IKEA's store in Ashton-under-Lyne, which opened in 2006, was their first in a town centre. TAMESIDE is currently undergoing a transformation through the Vision Tameside project which should be completed by 2018. Vision Tameside – a partnership between Tameside council and Tameside College – is a redevelopment strategy. Three "advanced learning centres" are being built in central Ashton town and at the college's Beaufort Road home. Phase one comprises two sites. The new Clarendon Sixth Form College, which began taking students in the autumn of 2015,was officially opened by Coronation Street actress Brooke Vincent on 9 March 2016. The college theatre was named in Brooke's honour. An "advanced technologies centre" is being built on Stamford Street, Ashton. When it opens in 2017 it will provide a learning facility to support the growth of advanced engineering and technology in Tameside. Phase two of VisionTameside will create an advanced skills centre for Tameside College alongside a new joint service centre for Tameside Council and partners. The skills centre will provide facilities for students studying a wide range of vocational subjects including hair and beauty, hospitality and catering, bakery and confectionery, travel and tourism and business skills. Ashton's Victorian town hall and the old water board offices, which are both listed buildings, are being retained. Work should be completed in early 2018. Provision for students with severe learning difficulties and/or disabilities will continue to be based at the Beaufort Road where a new sports academy was opened in February, 2015, by former Manchester United and England footballer Paul Scholes. In addition, Ashton's old public baths, which lay derelict for many years, has been reborn as a "high-tech business incubator" with help from the European Regional Development Fund and the Heritage Lottery Fund. Work at the mid-Victorian building, which closed as a swimming baths in 1975, has involved cleaning, repairs and the replacement of external stonework. The new office space is housed inside a free-standing timber-clad pod within the former main pool. At the same time, Ashton's market has been refurbished with the installation of kiosks alongside traditional stalls. The Ashton Arcades shopping centre opened in 1995. The centre covers 13,000 square metres (140,000 sq ft) on two floors with over 40 shops. In 2006, after failing twice to gain permission to develop a site in the neighbouring borough of Stockport, IKEA announced plans to build its first town centre-store in Ashton-under-Lyne. The store is expected to create 500 new jobs as well as attract other businesses to the area. The store opened on 19 October 2006 and covers 27,500 square metres (296,000 sq ft) At the time of its creation, the store was the tallest in Britain. Life science industries have been identified as growth industries in Greater Manchester and are concentrated in Oldham and Tameside. Average house prices in Tameside are the 7th highest out of the ten metropolitan boroughs in Greater Manchester, 11.9% below the average for the county. At the 2001 UK census, Tameside had 152,313 residents aged 16 to 74. 2.0% of these people were students with jobs, 5.7% looking after home or family, 7.9% permanently sick or disabled and 3.2% economically inactive for other reasons. In 2001, of 96,255 residents of Tameside in employment, the industry of employment was 21.7% manufacturing, 10.4% health and social work, 18.2% retail and wholesale, 10.2% property and business services, 7.2% construction, 6.8% transport and communications, 6.4% education, 5.3% public administration and defence, 4.2% finance, 4.0% hotels and restaurants, 0.9% energy and water supply, 0.5% agriculture, and 4.0% other. This was roughly in line with national figures, except for the proportion of jobs in agriculture which is less than half the national average, and property which was also below the national average. Manufacturing was 50% more than the national average. The Church of St Michael and All Angels, Mottram in Longdendale, is one of Tameside's Grade II* listed buildings. In February 2001, Tameside had one Grade I listed buildings, 19 Grade II*, and 289 Grade II. The number of Grade I listed buildings in Tameside has increased to three, these are St Anne's Church in Haughton; St Michael and All Angels' Church in Ashton-under-Lyne; and Fairbottom Farm Barn, a 17th-century farm building. In Tameside are three of Greater Manchester's Sites of Special Scientific Interest, Boar Flat, part of Dark Peak, the Hollinwood Branch Canal and the Huddersfield Narrow Canal. The Huddersfield Narrow Canal runs for 20 miles (32 km) from Huddersfield to Ashton-under-Lyne; it is protected for its biological interest, and is "the best example of a flowing eutrophic water system in Greater Manchester". There are three Scheduled Ancient Monuments in the borough, a Bronze Age cairn in Stalybridge, Buckton Castle, and Nico Ditch. Buckton Castle is a 12th-century enclosure castle near Carrbrook and was probably built by one of the earls of Chester. The castle lay ruinous by 1360, and has been described as "one of England's most important castles". Nico Ditch is an earthwork running from Ashton-under-Lyne in the east to Stretford in the west, in the borough of Trafford. It survives to a depth of 1.5 metres (4.9 ft) in some places and is up to 4 metres (13 ft) wide. Tameside has nine conservation areas: Ashton and Stalybridge town centres; Carrbrook, Copley St.Paul's, and Millbrook in Stalybridge; Fairfield in Droylsden; Mottram-in-Longdendale; Portland Basin; and St.Anne's in Haughton. The Museum of the Manchester Regiment is housed in Ashton-under-Lyne's town hall. The museum displays relics related to the Manchester Regiment including five Victoria Crosses awarded to members of the regiment. Park Bridge Heritage Centre in the Medlock Valley is a museum dedicated to the history of the settlement of Park Bridge and its industry. Broad Mills Heritage Site, in Broadbottom, preserves the remains of an early 19th-century textile works. Art galleries in the borough include Astley Cheetham Art Gallery in Stalybridge and Central Art Gallery in Ashton-under-Lyne. Tameside has eight designated Local Nature Reserves which are Knott Hill, Hollinwood Branch Canal, Great Wood, Haughton Dale, Hulmes and Hardy Woods, Castle Clough and Cowbury Dale, Hurst Clough and Rocher Vale. Four more are to be designated. Since 2007 Tameside's schools have been transformed as the result of multimillion-pound investment. Virtually every high school has been replaced or remodelled. Eighteen primary schools have been rebuilt in recent years and another 20 have undergone major remodelling. In addition, the borough has opened the first entirely new schools in its history: Inspire Academy on Mossley Road, Ashton, and Discovery Academy off Porlock Avenue, Hattersley. Both offer 420 places plus a nursery. In 2015, GSCE results improved more in Tameside than anywhere else in the North West, and the borough was one of the top 10 nationally for the most improved results. At Key Stage 4 57.3% of pupils in the borough achieved five or more A* to C grades including English and maths – a 3.6% improvement on the previous year. In terms of expected progress in English, 73% of pupils make expected progress in Tameside compared to 71% nationally. In maths 66% of pupils make expected progress, in line with the national average of 67%. At Key Stage 2, 80% of pupils in Tameside achieved level 4+ in reading, writing and maths combined, sustaining the borough's 6% improvement in results from 2013 to 2014. Work on an extension of the Manchester Metrolink costing £260 million began in 2008. Trams began to run to Droylsden in February 2013, and to Ashton in September 2013. Ashton Bus Station is being converted into a state-of-the-art transport interchange. A covered concourse will replace the five island platforms, and the site will be linked to the Metrolink terminus. It will have new waiting areas, bicycle parking, and better access to travel information and tickets. Improved pedestrian routes will take people into the town centre. Construction is expected to take two years and the interchange should be open by the end of 2018. The new Hyde Bus Station opened on 23 August 2007, having cost £3.7 million. Tameside Council is responsible for maintaining the public rights of way in the borough, including 145 mi (233 km) of footpaths. In 2014, the Government finally gave the go-ahead to create a bypass between the M67 and the A628 as part of a £15 billion national transport spending plan. The borough is served by 13 railway stations. Denton railway station is on the Stockport to Stalybridge Line. Fairfield railway station, Guide Bridge railway station, Hyde Central railway station, and Hyde North railway station are all on the Hope Valley Line between Sheffield and Manchester. Broadbottom railway station, Flowery Field railway station, Godley railway station, Guide Bridge railway station, Hattersley railway station, and Newton for Hyde railway station are served by the Glossop Line between Glossop and Manchester. Ashton-under-Lyne railway station, Mossley railway station, and Stalybridge railway station are on the Huddersfield Line. Some localities were originally twinned with a place within the Metropolitan Borough prior to its creation in 1974. In the list below the brackets show where the place was twinned with before 1974 and since when. Tameside is home to a number of Non League football teams, and a variety of other sports clubs. ^ "Tameside Metropolitan Borough resident population estimates by ethnic group (percentages) 2005 estimate". Statistics.gov.uk. Retrieved 5 May 2008. ^ Nevell (1992), pp. 21, 25. ^ Nevell (1992), pp. 29-31. ^ Nevell (1992), pp. 40-41. ^ Nevell (1992), p. 34. ^ Nevell (1992), p. 51. ^ Nevell (1992), p. 55. ^ Nevell (1992), pp. 56-59. ^ Nevell (1992), p. 60. ^ Nevell (1992), p. 75. ^ Nevell (1992), p. 76. ^ a b Nevell (1992), pp. 77-83. ^ Nevell (1992), p. 85. ^ Nevell (1991), pp. 7-9. ^ Nevell (1991), pp. 46-47. ^ Nevell (1993), p. 13. ^ a b McNiel and Nevell (2005), p. 54. ^ Nevell (1993), p. 170. ^ a b c Frangopulo 1977, p. 168. ^ a b c d e f Clark 1973, p. 102. ^ "Boundary shake-up means 'all out' vote". Manchester Evening News. 29 August 2002. ; retrieved 4 September 2008. ^ Tameside Metropolitan Borough Council (16 January 2007). "The Tameside Citizen: Orders to tackle crime and disorder". Tameside.gov.uk. Archived from the original on 2 May 2009. Retrieved on 4 September 2008. ^ Nevell (1992), p. 8. ^ Nevell (1992), p. 10. ^ a b Nevell (1992), p. 11. ^ "Tameside physical environment". Statistics.gov.uk. Retrieved 25 May 2008. ^ "Tameside Metropolitan Borough Council comprehensive performance assessment (CPA) scorecard 2007". Audit Commission. 2007. Archived from the original on 2011-09-30. ; retrieved 8 September 2008. ^ National Association of Local Councils. "What is a town, parish or community council?". nalc.gov.uk. Archived from the original on 21 December 2008. Retrieved 26 January 2008. ^ "Mossley civil parish census data". Statistics.gov.uk. Retrieved 21 February 2008. ^ "Tameside local elections 2007". BBC Online. 4 May 2007. Retrieved 8 March 2008. ^ "Tameside local elections 2008". BBC Online. 2 May 2008. Retrieved 5 May 2008. ^ "Tameside local elections 2008". Tameside MBC. 7 May 2008. Archived from the original on 2010-05-10. Retrieved 16 May 2010. ^ "Tameside local elections 2012". Manchester Evening News. Retrieved 9 May 2012. ^ a b c d "Tameside Metropolitan Borough key statistics". Statistics.gov.uk. Retrieved 21 December 2007. ^ "Tameside Metropolitan Borough household data". Statistics.gov.uk. Retrieved 21 December 2007. ^ "Tameside Metropolitan Borough population density". Statistics.gov.uk. Retrieved 21 December 2007. ^ "Tameside Metropolitan Borough country of birth data". Statistics.gov.uk. Retrieved 21 December 2007. ^ "Tameside Metropolitan Borough ethnic group data". Statistics.gov.uk. Retrieved 21 December 2007. ^ "Tameside social class". Vision of Britain. Retrieved on 6 September 2008. · "England social class". Vision of Britain. Retrieved on 6 September 2008. ^ "Parishes of the Catholic Diocese of Shrewsbury". Dioceseofshrewsbury.org. Retrieved 17 January 2008. ^ "Parishes of the Diocese". Salforddiocese.org.uk. Archived from the original on 11 January 2008. Retrieved 17 January 2008. ^ "Church of St Anne". Images of England. Retrieved 22 December 2007. ^ a b "Church of St Michael and All Angels". Images of England. Retrieved 22 December 2007. ^ Nevell (1991), pp. 121, 135. ^ Nevell (1991), pp 123–24. ^ "Ikea's superstore plans approved". BBC Online. 11 January 2006. ; retrieved 3 September 2008. ^ Emma Unsworth (16 October 2006). "IKEA's finally here". Manchester Evening News. Retrieved on 3 September 2008. ^ "Promoting a Dynamic Economy". Greater Manchester e-Government Partnership. Archived from the original on 2008-01-12. ; retrieved 4 September 2008. ^ "House prices for Greater Manchester Local Authorities". BBC News Online. 16 March 2010. Retrieved 1 April 2010. ; retrieved 4 September 2008. ^ a b "Tameside Local Authority economic activity". Statistics.gov.uk. ; retrieved 1 September 2008. ^ "Tameside Local Authority industry of employment". Statistics.gov.uk. ; retrieved on 1 September 2008. ^ "Images of England Statistics by County". 2001. Retrieved 22 December 2007. ^ "Fairbottom Farm Barn". Tameside Metropolitan Borough Council. Retrieved 2007-12-22. ^ "Hollinwood Branch Canal" (PDF). EnglishNature.org. Retrieved 26 January 2008. ^ "Huddersfield Narrow Canal" (PDF). EnglishNature.org. Retrieved 26 January 2008. ^ "Monument no. 78454". Pastscape.org.uk. Retrieved 27 January 2008. ^ Grimsditch, Nevell & Nevell (2012), pp. 53, 82–85. ^ "The lost castle of Stalybridge". BBC Online. 30 July 2008. ; retrieved 9 September 2008. ^ Tameside Metropolitan Borough Council (November 1992). "Appendix 6: Conservation Areas and Scheduled Ancient Monuments (Policies C11 and C30)". Tameside.gov.uk. Archived from the original on 2009-05-02. ; retrieved 4 September 2008. ^ "Museum of the Manchester Regiment". 24hourmuseum.org.uk. Retrieved on 4 September 2008. ^ Tameside Metropolitan Borough Council (13 September 2007). "Park Bridge". Tameside.gov.uk. Retrieved on 4 September 2008. ^ "Broad Mills Heritage Site: site introduction". BroadbottomVillage.com. Archived from the original on 2008-11-20. Retrieved on 4 September 2008. ^ Tameside Metropolitan Borough Council (15 October 2007). "Astley Cheetham Art Gallery". Tameside.gov.uk. ; retrieved 4 September 2008. ^ Tameside Metropolitan Borough Council (16 August 2007). "Central Art Gallery". Tameside.gov.uk. Archived from the original on 30 May 2008. ; retrieved 4 September 2008. ^ "Local Nature Reserves - Nature On Your Doorstep". Tameside Council. Retrieved 27 January 2011. ^ Tameside Metropolitan Borough Council (16 January 2007). "Rights of way". Tameside.gov.uk. Retrieved on 5 September 2008. ^ Tameside Metropolitan Borough Council : Report to Executive Cabinet, 3 September 2008: Kiagware Project Archived 2011-06-14 at the Wayback Machine; retrieved 8 January 2010. ^ "British Towns Twinned with French Towns". France Magazine. Archant Life. Retrieved 13 September 2008. ^ Gemeinde Ruppichteroth : Städtepartnerschaft mit Longdendale Archived 2011-07-11 at the Wayback Machine, 13 December 2006; retrieved 8 January 2010. ^ Ville de Champagnole: Jumelage Archived 2011-07-20 at the Wayback Machine; retrieved 8 January 2010. ^ Ville de Villemomble : Les Villes Européennes Jumelées avec Villmomble Archived 2008-11-20 at the Wayback Machine; retrieved 8 January 2010. ^ Tameside Metropolitan Borough Council: Tameside's Link with Bengbu; retrieved 8 January 2010. ^ Tameside Advertiser: Cut Ties with African Town, 28 August 2002; retrieved 8 January 2010. Frangopulo, Nicholas Joseph (1977). Tradition in action: the historical evolution of the Greater Manchester County. Wakefield: EP Publishing. ISBN 0-7158-1203-3. McNeil, R. & Nevell, M. (2000). A Guide to the Industrial Archaeology of Greater Manchester. Association for Industrial Archaeology. ISBN 0-9528930-3-7. Nevell, Mike (1991). Tameside 1066–1700. Tameside Metropolitan Borough and Greater Manchester Archaeological Unit. ISBN 1-871324-02-5. Nevell, Mike (1992). Tameside Before 1066. Tameside Metropolitan Borough and Greater Manchester Archaeological Unit. ISBN 1-871324-07-6. Nevell, Mike (1993). Tameside 1700–1930. Tameside Metropolitan Borough and Greater Manchester Archaeological Unit. ISBN 1-871324-08-4. Nevell, Mike & Walker, John (1999). Tameside in Transition. Tameside Metropolitan Borough with University of Manchester Archaeological Unit. ISBN 1-871324-24-6. Wikimedia Commons has media related to Metropolitan Borough of Tameside. Wikivoyage has a travel guide for Tameside.